Urdu is a language of love, propriety and warmth. You can make Urdu a part of your celebrations in many ways and one of them is by including the language in your party favours. Check out this blog post of how to plan and make party favours with Urdu included in them. Party favours were always part of celebrations in our South Asian culture as guests are never returned empty handed and are sent back with mithai (traditional sweet treats) or some other token. Party favours have now taken on a new life. They add colour to the party decorations and show the appreciation of the host for the guests. I love planning party favours and adding Urdu in them if possible. This is part of my conscious effort to make Urdu part of our celebrations as I bring up my bilingual children in Canada. Making party favours with Urdu can be elaborate or as simple as adding a tag in Urdu. This is what I did for a friend’s birthday this weekend. There are many words to express gratitude in Urdu and I chose “bohat shukriya” for the party guests. You can either write it in Urdu yourself or use a printout. I added stickers with the labels and tried to add more colour with washi tapi to the black and white boxes. Inside the boxes I added a nail polish and a chocolate. 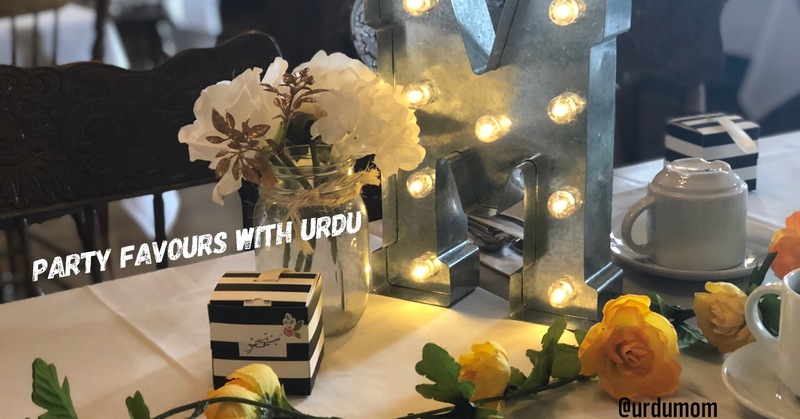 Do read this blog post about more ideas on how to bring Urdu in our birthday celebrations and below is a video of Zeynab and I singing the Happy Birthday song in Urdu. Do remember that your children will learn and appreciate Urdu more when they see you respect and love the language. Teaching your children Urdu starts with keeping the language alive in your house. There are some really creative ways to have party favours with Urdu such as by Up a Notch Personalized Favors. I loved the word play she did with “wow”. How do you include Urdu in your celebrations? Would love to hear from you!